Teacher Appreciation Week is the first full week in May.Don’t miss these Teacher Appreciation Ideas (more sayings and packaging ideas)! 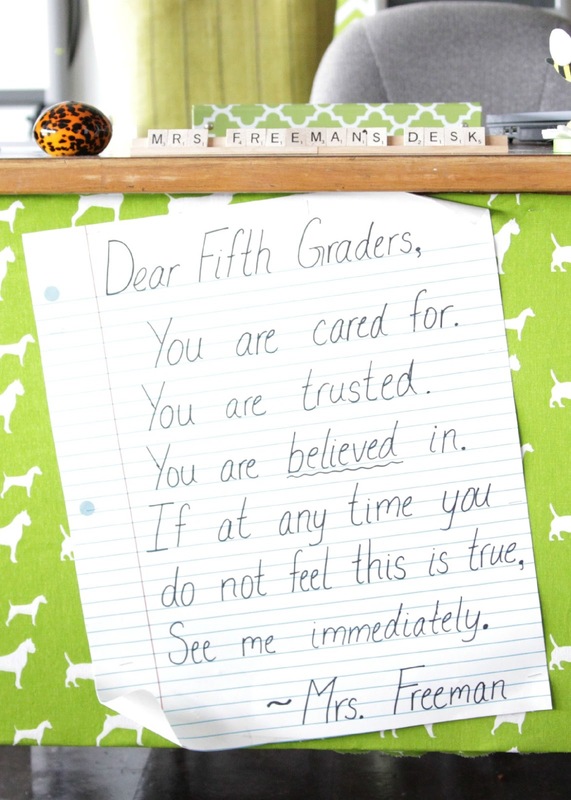 Here are 100 great ways to thank a teacher and 50 cute sayings for Teacher Appreciation. Just add a small gift and attach the saying and you have an easy way to say thank you. Your teacher has worked hard all year! 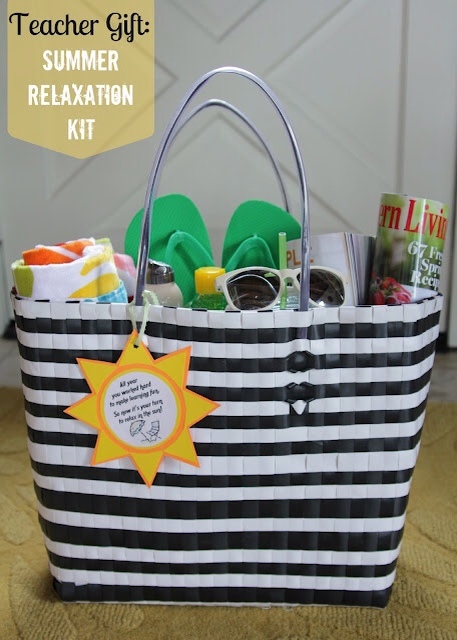 Give them the perfect summer relaxation kit! Heather is here to tell you exactly how to make one. She is a teacher so she knows exactly what teachers want! Hello there Skip to My Lou Readers. I’m Heather Freeman from The Lovely Cupboard, and I’m so excited to be a part of the Teacher Appreciation Series this year. Being a 5th grade teacher myself, I personally know how much a token of thanks means at the end of a long school year. The kids may not realize it, but teachers are counting down the days until June just like our students! The gift I’m sharing today is a bag filled with items that will come in handy poolside or at the beach. Start with a cute tote and fill it with all sorts of goodies. The fun part is that your child can help pick out the things for their teacher. I purchased all the items at Wal Mart, and it took less than 15 minutes to put this bag together. I started with the tote and then picked the beach towel. 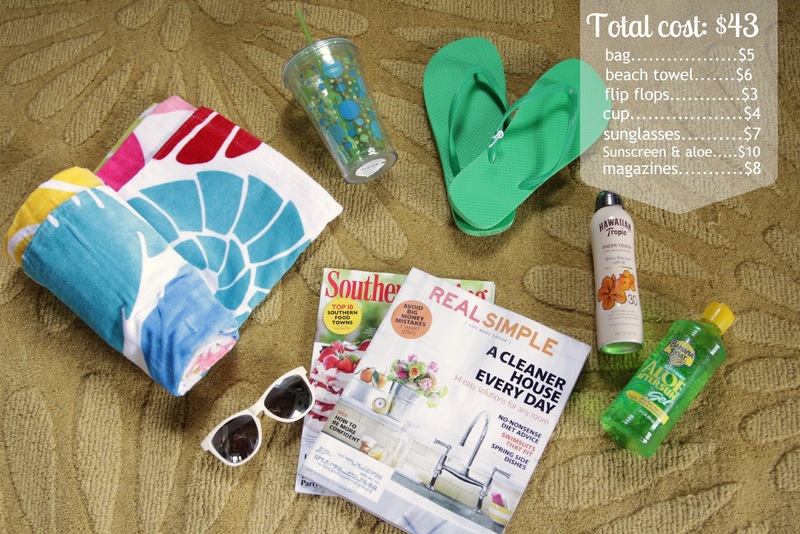 I tried to pull from the colors in the beach towel for the other items. I printed up this little note on the computer, but you could have your child write the gift tag. If you run out of time and just can’t get a bag together, don’t feel bad about snagging a gift card in the check out line. Teachers love them…really we do! Here’s to sleeping in, days by the pool, and no homework…(sigh). I can’t wait! This is such a great idea that we created a printable gift tag for you! I was wondering how did you make the sun for the relaxation kit? Did you use a circuit machine? This is great idea and we're definitely going to do it! Can you send me a working link for the adorable tag? thanks so much!!! 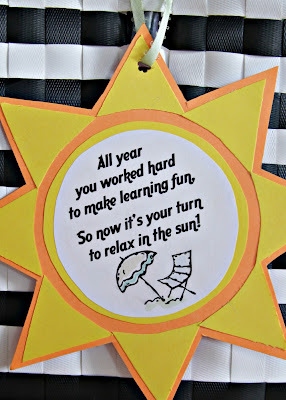 All year you worked hard to make learning fun, so now it's your turn to relax in the sun ! LOVE this idea! We are gathering items today in pink, to match the bag we bought. I cannot get the tag to work however. Can you send it to me via e-mail? Can you please send me the link to the tag as well. Can you send me the tag via email? Thanks! This is a great idea! In Fact, I would love to use it. Could you please send the link for the printable tag?! Thanks! Love this idea! Can I please have a working link for the tag? I would love to use it for our teachers! Thanks! Could you please send me the link to the printable for this? It's not showing up. Thank you!! I too love this idea! Can you email me the link for the tag, please? When I click on the link provided, it states 'File not Found'. Thanks! So super cute! My daughter will love putting this together for her teacher. Can you please send the link for the tag. The one here on your page does not work. Thanks!! Love the summer relaxation gift! How did you get the items to stand higher in the bag so that they're visible. I have a tote bag but all the items keep falling to the bottom! Michelle, try filling the bag with tissue paper, or place a box in the bottom. Hope this helps. 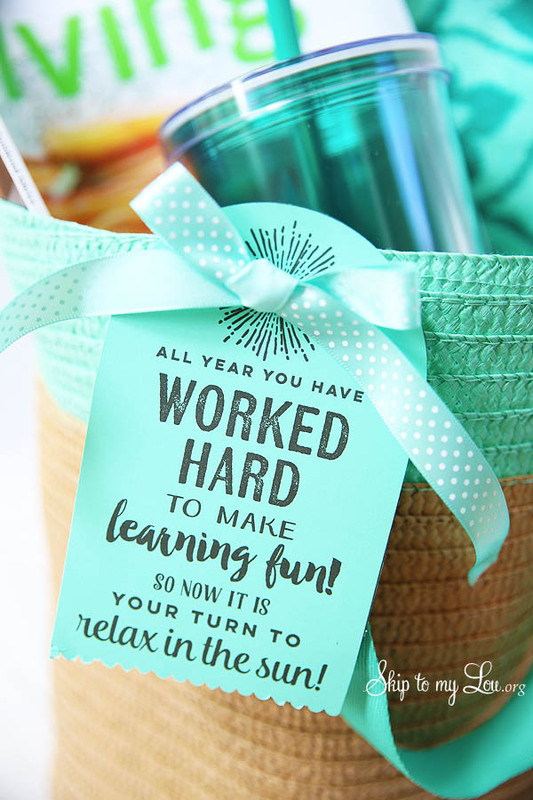 Love the fun in the sun teacher gift idea! Great ideas! Could you please send me a working link for the cute printable tag? I cannot get the link on this site to work. Thanks! Excellent idea, and the best is, I can customize it, and can be adjusted to your my own budget. Hola, felicidades me encantaría recibir patrones de bolsos, con bases. Les agradezco. Buen día. This is the perfect teacher gift to end off the year! My daughter is super excited to create this! Could you please send me the cute tag....I can't get it for some reason!!! Have a great day!!! Would you send me a link for the cute tag....thank you for the sweet idea!!! Great idea! I am doing this for my daughters teacher! I ordered a monogrammed cooler bag to use as the bag instead...thought this might be fun too! LOVE this cute idea! I have the bag assembled but cannot find a link to the printable tag. Please e mail if you don't mind :) THANKS!!! This is great idea. but the tag link doesn't work just fyi. if you cacn send it that would be great. Thanks! We're doing a "fill-the-bag" version where everyone brings one item for the teacher (this works for that "team" concept too.) I had some ideas for a male teacher: Do the Beach towel and the bag, but add a small package of golf balls and racquet or tennis balls, chapstick and sunscreen, maybe an inexpensive fishing hat or baseball hat and maybe an iTunes gift card. Also trying to get the printable tag, could you email it to me please? Thanks for the wonderful idea! I made these and used them for teacher appreciation week. We made them summer survival kits instead. And instead of getting all the stuff from walmart we used the dollar tree to get the stuff to put in them. All together we made 3 and spent less than $50 for them all!!! Thanks this was a great idea! The link for the tag is not working for me either? Such a cute idea ... if you could please send to me as well? Thanks! I really like this idea for the teachers at my school, but I can't get the link for the tag to work. Would you please send it to me? Thank you. this is one cool gift idea! perfect gift to end the school year. my idea to give next year. you can't do without for a week. In general, you want to make sure that your earthquake survival kit has enough supplies to last for three days. should also be well provisioned in his wilderness survival kit. to you and notifies them of your identification and location. This is such a cute idea. I am going to do this after the year is over. My childs teacher already announced that she is retireing after this year and this would be so cute. I LOVE this idea!! Perfect for the last day of school! I think I'll throw in a bottle of bright nail polish too! I will be giving these lovely bags as an end of the year gift to both of my fabulous assistants!! can't be a better gift for a teacher!!! This is a great idea. I got all the items today. Thank you! I canot get the printable tag. Would you email it to me? Love this idea!! I'm not able to get the printable note either. Would you mind e-mailing it to me? LOVE this idea, thanks for sharing. When I tried to get the note, the link wasn't working - any way you can e-mail it to me please? This is a great idea! I would like to use it for my assistant teacher. When I click to get the printable note it does not come up. Is there something I need to do? I absolutely love this idea - I am heading to Walmart right now to pick up all the items! For some strange reason, the printable link is not working. Would you mind emailing it to me? Thanks!! I LOVE this idea! I went to Wal-Mart yesterday, and put together two similar bags for my son's two teachers. Thanks for the great idea! I would really like the printable note if you could send it to me! Thanks! I work at a preschool and got a gift like this years ago and LOVED it!!! Still in the top 5 of favorite all time presents!! I loved your sun and saying. I used that and the beachbag to go with the towel and handmade ribbon flip flops I was giving to my daughters teacher. Great idea! This is great for one teacher but son has 9 teachers because he is on a collaborative team and many of his classes have two adults in the room. There is no way I could afford $43 for 9 people! Be realistic! What do you use as a filler so the items stand up in the bag? The link to the note is not working. I would really love to use it. Is there any way you could send it to me? Thanks a bunch! LOVE this idea! I also tried printing the note, but it looks like it is no longer available online? Thanks! I love that this gift will most likely be used. Thanks for sharing, it's perfect for my daughter's preschool teachers. Love this idea! I could not get the free printable note. Please help. Would like to use this idea for an end of the year gift. Hope to get a reply. THANKS!! I wanted you to know I put a link to this on my website. Love the idea. I'm going to use it for a teenager getting out of school, too. Love the gift idea! Am actually going to give it to her the last day of parent appreciation. The rest of the week I gave her little goodies. 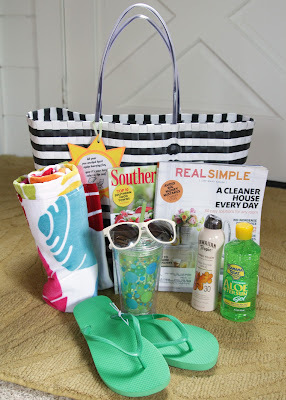 Oh and Dollar Tree has beach bags and flip flops total cost less than $25 bucks. My class is going to do this for our teacher, because this is such a great idea. However, I can't get the little note. Could you please help me out? We did this gift idea for my son's kindergarten teacher last year and it was such a hit that we will be doing it again for his first grade teacher this year on the last day of school. Our teachers are amazing and they deserve the best. Love all the other ideas on this blog. Will have to use them in the future. Brilliant idea! Now to find out if my daughters teacher is going anywhere nice on holiday (wouldn't be much use in Northern Ireland otherwise lol). Tried to print the tag but saying the document doesn't exist, will come back later and check again! This is a great idea!! and with my extreme couponing I have about everyone of these items in my stock that cost me les than $5!! Love this idea. I make a first day survival kit for my kids' teachers. I put candy, gum, hand sanitizer, water, favorite pop, money for pop machine and snack machine, granola bar, air freshner, and anything else I can think to help their first day go a little easier. All in a cute plastic tub or whatever I can find. Oh, my! I would have loved getting a gift like this! I am a newly retired teacher. If a parent wanted, they could pool resources with several others. Each could buy something for the tote. Wow! The teacher might end up with some outstanding homemade and handmade goodies. Remember to include a note handwritten by your child. If necessary, have the child dictate while you write. Then have the child copy the note....include your copy if needed for interpretation! Hey, I would start on a bag for next year's teacher....and give it as an introduction to your child. Your child could make things for the bag this summer! I log this idea, I'm going to do it for one of our girls teachers. Loving this sieries of posts... Any ideas for a male teacher?? What an awesome idea, thank you so much for it! how can I share this in my blog? This is a great idea! Thanks for the idea! This is a very thoughtful gift and an idea that I hadn't thought of. Those kinds of gifts are always fun to give and receive.